Did you know there are eight Cirque du Soleil productions in Las Vegas? No matter which one you choose you will experience the jaw-dropping artistry, incredible acrobatics and feats of strength Cirque du Soleil is known for. We particularly love Michael Jackson ONE at Mandalay Bay. The King of Pop and his music come to life in a way you’ve never experienced before as Cirque beautifully acts out each of Michael’s hit songs. Vegas is often thought of as an adults-only city, but there are quite a few shows on the Strip that are for the entire family, like Blue Man Group at the Luxor. This fun-filled production combines interactive music, art, and technology with hilarious interactions from the fun Blue Men. The bright lights, drum beats and vivid colors make you feel like you are actually at one of Vegas’ nightclubs rather than a show, except a nightclub where your kids can have fun too. How fun is that? 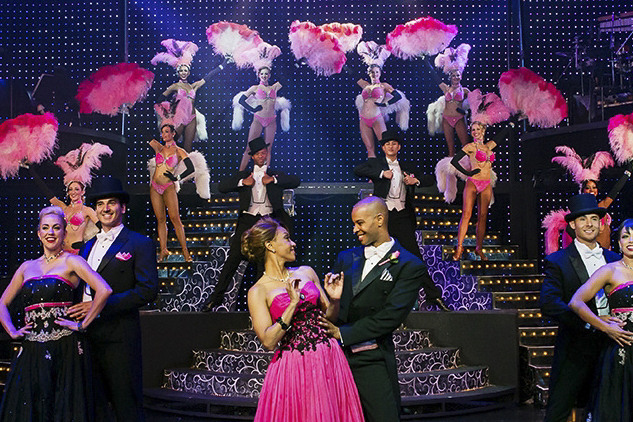 Come experience classic Vegas during the hit show Vegas! The Show inside the Saxe Theater at Planet Hollywood. This family-friendly show will take you back to the days when the Rat Pack and Elvis Presley ruled the Vegas stage. Vegas showgirls will highlight the heyday of city’s glitz and glamour era and Vegas icons Vegas Vic and Sassy Sally also make an appearance. Following with the family-friendly theme, parents and kids will love the puppets and jokes during Terry Fator: The Voice of Entertainment at the Mirage. There is nothing quite like a ventriloquist and when you find one like Fator you won’t believe your eyes. Fator amazes with his ability to go between puppet and self as he sings, cracks jokes and does celebrity impressions. It’s all backed by a live band too. Newsweek has called Celine Dion’s show at the Colosseum at Caesars Palace “The biggest act since Elvis,” which is saying something. The Grammy Award-winning singer performs her biggest hits including “My Heart Will Go On” and many, many more. Dion also performs covers ranging from Journey to Janis Ian. It all comes together with 31 onstage musicians including a five-piece horn section and a 16-piece string orchestra and a stunning light and a video display. As if being on the Strip wasn’t already an altered reality, the show Le Reve – The Dream at Wynn Las Vegas will whisk you away to a dream-like world where the stage is made up of water. Yes, water. Watch as gymnasts, aerialists and synchronized swimmers dance and play in this stunning show. Vegas is full of magic shows, but none like Criss Angel Mindfreak Live! Based on Criss Angel’s breakout hit TV show, MINDFREAK, the show incorporates Angel’s most complex illusions ever performed on stage for a 90-minute production you won’t see anywhere else. As if that wasn’t exciting enough, Criss Angel Mindfreak Live uses state-of-the-art animated LED lighting and RGB laser explosions, LED virtual worlds, 3D immersive effects, live musicians and more to make this show unforgettable. We can’t give you the 10 best shows in Vegas without offering a comedy show. And what better comedian than Jerry Seinfeld? Hailed as one of the greatest comedians of all time, Jerry Seinfeld brings his observational humor and dry wit to The Colosseum at Caesars Palace on a regular basis. Don’t miss the Emmy Award winner do what he does best. Looking for something a little more adult and risqué? Head to the Big Top at Caesars Palace for Absinthe. Just as its name suggests, Absinthe is intoxicating. It is circus, cabaret, and vaudeville all rolled into one featuring incredible acts, daring feats, seductive performers and the host the zany and charming The Gazillionaire. For one final adults-only show check out Magic Mike Live at the Hard Rock Hotel. Created by actor Channing Tatum, this seductive show recreates the mythical Club Domina where guests can enjoy 13 of the hottest and most talented men act out 13 different sizzling fantasies, all while dancing, stripping and interacting with the audience. To experience these shows yourself, grab your discount show tickets at BestofVegas.com!